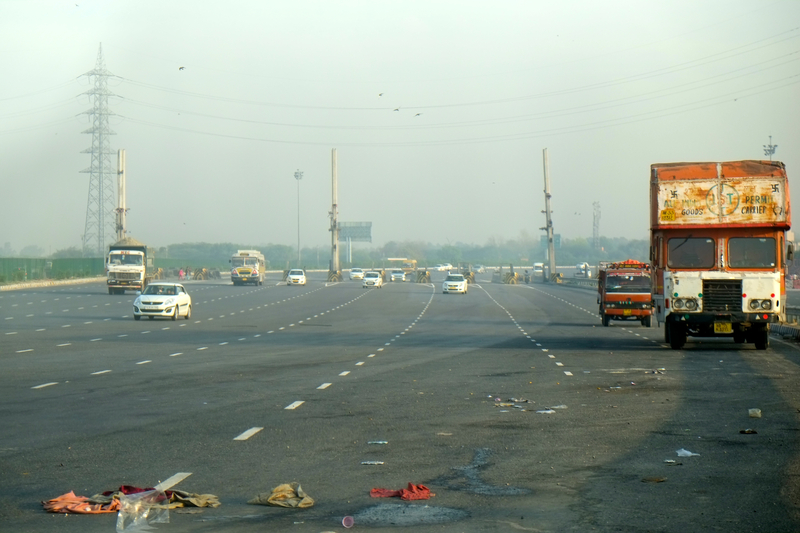 Highway in Delhi to Jaipur, India. Notice how dirty the road was. After missing my flight to Singapore and catch the next flight, I shopped around Changi Airport and drink a cup of tea with my mother while waiting for our flight to Delhi. Singapore Airlines flight to Delhi at 2.30 am local time and took five hours and thirty minutes. There were several American and European tourist on the plane, but most of them are Indian. Usually I watch movies on board but this time I jack up my Bose QC30 and listen to the jazz music on flight entertainment, an album by Kenny G “Brazilian Night”. I listened to it all over again while trying to sleep until we landed on Indira Gandhi International Airport. Sleeping on the plane was uncomfortable as usual, but I manage to get sleep for four hours because I knew I had to stay awake the next day. 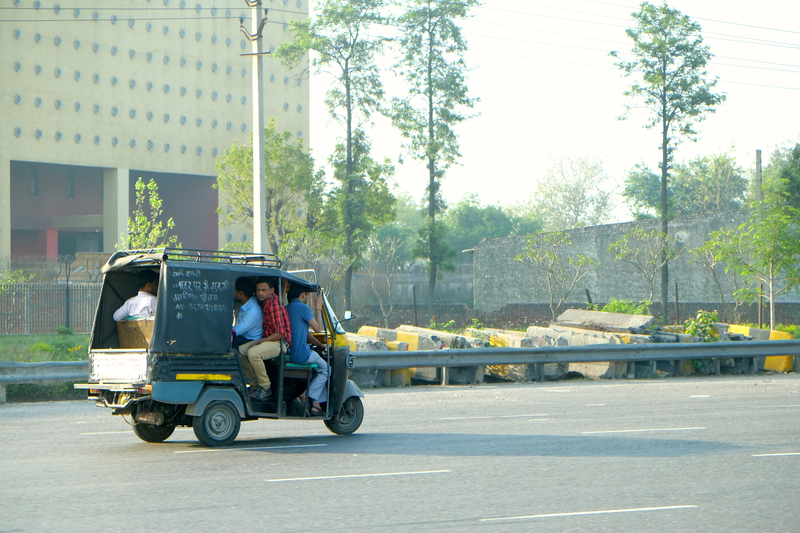 A tug-tug, Indian most common vehicle bringing workers to city in the morning. When we landed on the airport we were surprised by the quality of the building which exceed our expectation for a developing country. The floor was carpeted and the design is similar with Changi Airport, although there were only three duty free shops on the airport. Immigration was quite fast at 6 in the morning, but we had to queue for 15 minutes to exchange USD to INR with 1:58 rate. We picked up our baggage at the conveyor belt and went outside. Outside the arrival gate a forty year old man was waiting for us, he sortired us through the crowd and call for the car that was going to deliver us to Jaipur, the Pink City. My mother ask to buy a SIM card so we could stay in contact with people in Indonesia. It took quite long time about 30 minutes to register and activate the SIM card, my mother bought two cakes and a tea for $10 (INR 500) while waiting for the phone. The trip to Jaipur is 270 Km long which took approximately 6 hours drive from Delhi. We use Toyota Vios with an Indian driver name Ram. He is quite informative along the way, telling us about the culture and sites we pass through the drive. There were little landscape or cityscape to see on the drive, mostly farm fields and small stores or market. We stopped for toilet break once and bought two bottle of coca cola for 200 Rupee ($4), I think we got scammed for that one. Even in Indonesia a bottle cost only $1, and that was expensive already, but we got to piss so we considerit as the toilet fee. 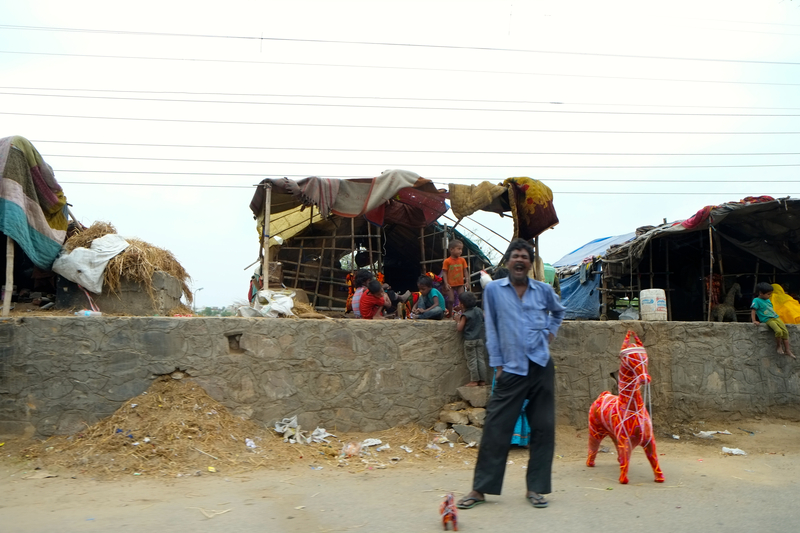 We drive across Rajasthan, which is a plain fields with small shops and market resembling a slum area. 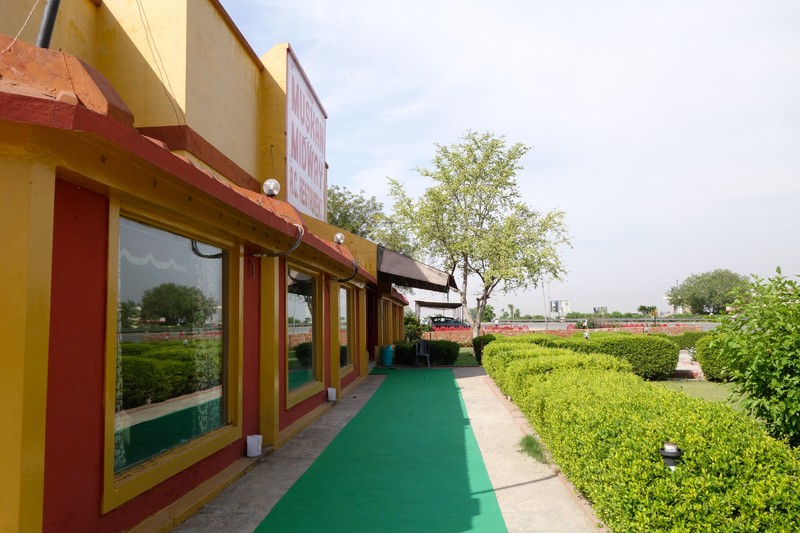 The expensive Coca-cola restaurant on the road to Jaipur. 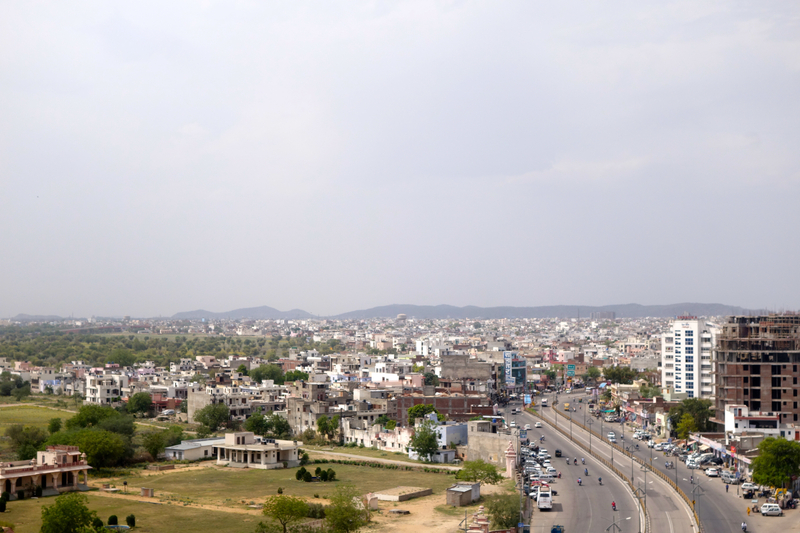 Jaipur is also known as the Pink City, because of the Terra-Cotta-Colored lime plaster that coats the old part of the city’s wall, buildings, and temples. The reasons for painting the town pink are unknown, some say it’s because Maharaja Jai Singh II’S being a devotee of Lord Shiva and as pink was his favorite. The most popular reason is that pink is the traditional color of hospitality, and the old part of city was freshly painted and paved with pink gravel to warmly welcome Edward VII for his visit here in 1876. The city of Jaipur taken from Libra Hotel. Once we arrived in Jaipur we went straight to Libra hotel for lunch. We ask for Chinese food and they did make us a four course Chinese food set, certainly not the best Chinese food I have ever eaten, but it is sufficient. We relaxed at the second floor restaurant and my mother chat with my sister via chatting messenger. Next we visited the pool onthe tenth floor of the building, where we can see Jaipur from the high point of view. We took shower after 2 days without showering and it refreshen us for the next activities. We had an appointment with our driver, Ram at 3.30 pm for souvenirs shopping so we came down to the lobby. Street life in Jaipur, India. Ram took us to a distant textile shop in the outer side of the city, which took 45 minutes drive. Personally we don’t really like it, but we finally bought five pashmina as souvenirs for my teacher. The drive back to the hotel took another 45 minutes and it was raining. We have a suspicion about Ram trying to squeeze us for shopping where he’ll take some commission from it. But we like Ram because he warned us about not going outside after dark and the horrible crime that could happen. We also talk about movies, the city culture and other informative tourist information. In the hotel we relaxed and make a cup of tea while waiting for dinner. Dinner was continental set, it seems that Indian people make western food much better than chinese food, they served us soup, grilled chicken and fries vegetables. Then we headed to our room and sleep early, rechargin energy for tomorrow city tour in Jaipur. 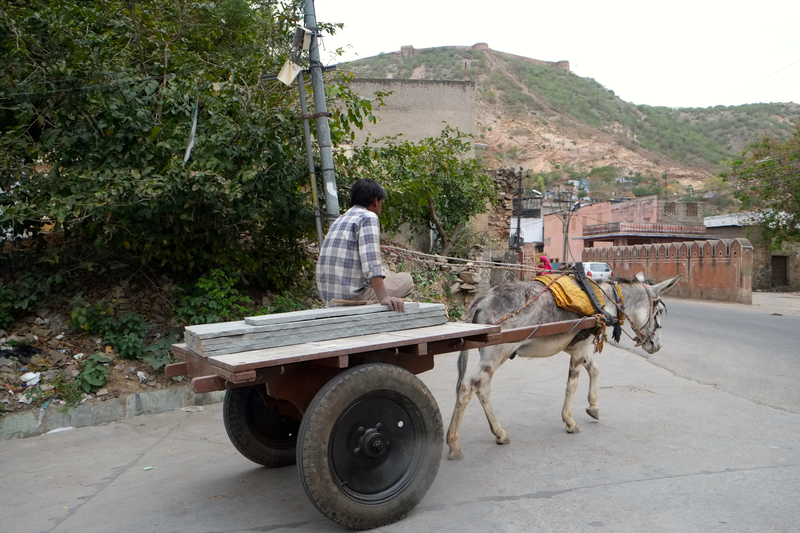 A donkey bringing construction materials in Jaipur, India. This entry was posted in India, Travel and tagged Delhi, India, jaipur, libra hotel, pashmina, pink city, road, shopping, souvenirs, Travel, trip. Bookmark the permalink.